The bluff of Matteo: can the demolition man rebuild Italy? Italy has sworn in its youngest prime minister, and Mattew Renzi has big plans. But Rome reporter Josephine McKenna asks: can the former Wheel of Fortune winner now win over a disaffected nation? Italy's former PM Silvio Berlusconi had been sentenced to jail -- yet he's already discussing his political comeback. And he's got some supporters, writes Josephine McKenna from Rome. As the European Central Bank was announcing its ambitious plan to save the euro late last week, Giovanni Calabri was wondering how to feed his family in the heart of Italy’s troubled south, writes Josephine McKenna. 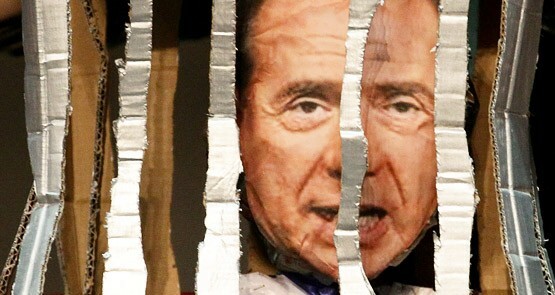 Silvio Berlusconi has re-emerged from the shadows to declare himself a candidate for prime minister next year, writes Josephine McKenna, an Australian freelance journalist in Rome. Flinging Spaniards back into substantial poverty is not something the Rajoy government is overly concerned about -- the very poor tend to be too busy surviving to have much time for organised political resistance. The Spanish bank bailout may have taken some heat out of the European crisis, but it's likely to be short lived as Italy's debt trap reminds the world why it should never have been admitted to the EMU. Beppe Grillo is an unlikely political hero. He is a comedian with a caustic wit better suited to stand-up rather than the Italian parliament, writes Josephine McKenna, an Australian freelance journalist in Rome. In the past 12 months raids from Milan to Taranto have delivered millions of euros in fake fashion merchandise, writes Josephine McKenna, an Australian freelance journalist in Rome.